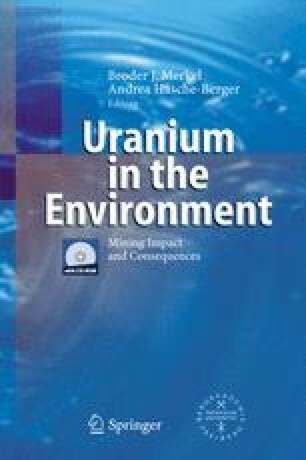 The uranium-radium mining industry generated about six million tons of radioactive by-products composed mainly by the tailings of uranium milling facilities and by fine mud deposits resulting from treatment of acid mine waters. Most of these radioactive materials are deposited on the ground in the village of Urgeiriça, near Viseu, and are currently exposed to weathering. Following rains, leaching and surface runoff of these tailings drain into a stream, Ribeira da Pantanha that joins the river Mondego. In this river a wide artificial lake, Barragem da Aguieira, is the main water reservoir for the centre region of the country. Other rivers flowing through the mining region, namely the rivers Dão, Vouga and Távora, may also receive drainage from the areas of old uranium mines. The radioactive contamination that uranium mining and milling wastes may have originated in rivers and water reservoirs is assessed.